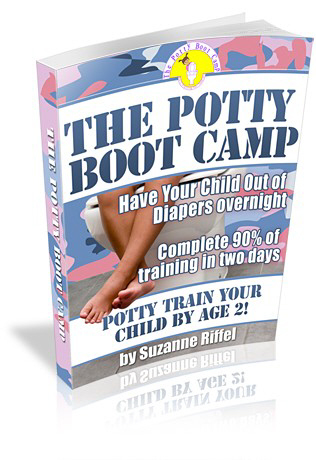 Potty Boot Camp: The method requires getting the child familiar with the potty and explaining "that is where you are to do your business, instead of their diapers". 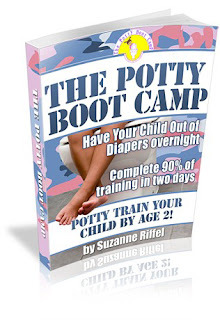 Such methods as in potty drills meaning getting the child used to a set time to go potty teaching them to pull their underpants down and sit on the potty giving praise if they do go and teaching them the importance of being a big person. Next phase means them going without diapers or underpants for a few hours a day in an effort to maintain and enforce the training procedure giving praise for being dry and negative reinforcement if they have an accident, if the child has mastered the experience of knowing when to go and staying dry they will be congratulated and be able to wear underwear, if the child is stubborn bribes such as toys or t.v. can be used in conjunction with the training and if bribes fail to influence the child more desperate measures may include taking a cherished thing away until they go to the potty then giving it back as a reward for being a big person. The last phase is maintenance ensuring the child stays on program and does not return to having accidents and not going to the bathroom, if not diligent the child could easily return to this stage requiring additional retraining of the child to return to their potty training habits. Highly recommended for parents with stubborn Toddlers!